Groundbreaking Probiotic To Improve Lactose Digestion Now Available to Distributors and Retailers. After taking a course of Lacto-Freedom... I ate ice cream and yogurt again with no problem. It's been over six weeks since that first cautious serving of ice cream, and I can still eat dairy with no problems. 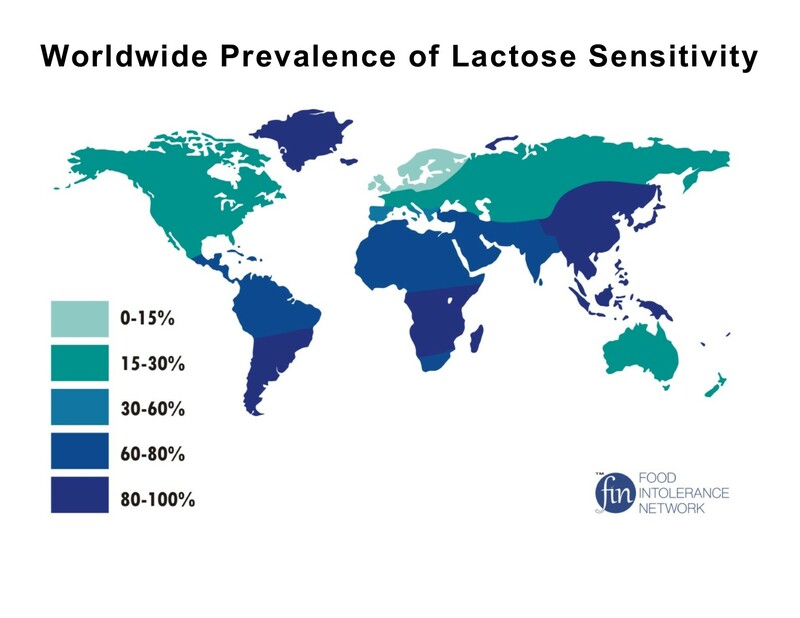 By some estimates, approximately 25 percent of the U.S. population has a reduced ability to digest lactose after infancy, causing issues such as gas, bloating, diarrhea, and abdominal cramps after consuming dairy products. The pharmaceutical company that pioneered a clinically-proven solution to the problems associated with the inability to digest milk and milk products is now making their probiotic available to distributors and retailers. Manzo Pharmaceuticals, maker of the Lacto-Freedom™ probiotic, is inviting physicians, pharmacies, and retailers to distribute the popular Lacto-Freedom probiotic, which customers have described as “life changing,” with “unbelievable results.” Distributors interested in carrying Lacto-Freedom™ probiotic can purchase cases of 24 bottles at a 50 percent discount, allowing them 100 percent markup. One bottle of Lacto-Freedom retails for $19.99. 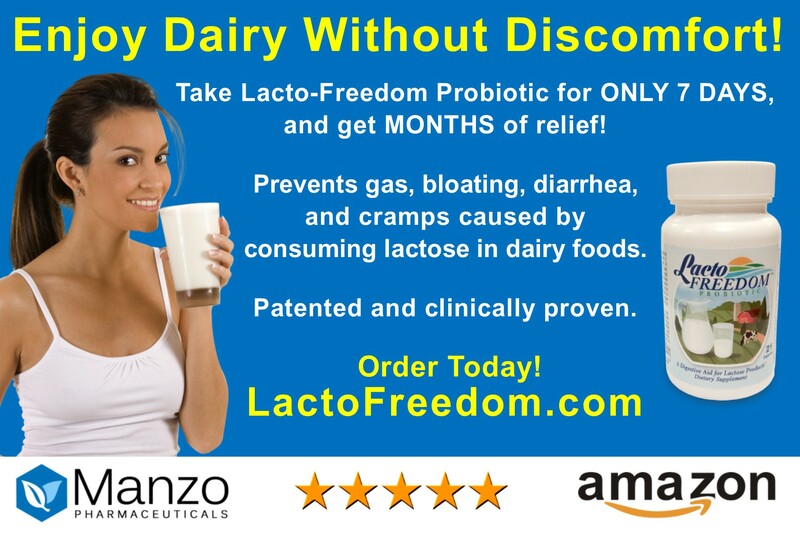 Pharmacist Ken Manzo of Manzo Pharmaceuticals created Lacto-Freedom probiotic to help the millions of people with a sensitivity to lactose more efficiently digest lactose for months, freeing more people to enjoy dairy. Click HERE to see a short video. 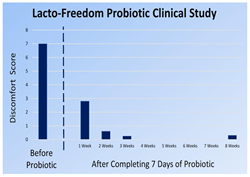 Lacto-Freedom™ probiotic is taken for only seven days but provides months of relief by coating the intestinal lining with billions of beneficial bacteria that colonize the intestines and produce lactase, the natural enzyme that helps break down lactose into more easily digested simple sugars. With Lacto-Freedom™ probiotic, people may enjoy dairy and lactose-containing products without experiencing abdominal pain, gas, abdominal bloating, and diarrhea, and without the hassle of taking lactase supplements with every lactose-containing meal. Learn more about Lacto-Freedom Probiotic at Lactofreedom.com. Manzo Pharmaceuticals, located in Pike County, Pennsylvania, was founded by licensed pharmacist Ken Manzo R. Ph. Manzo is the inventor of the patented Lacto-Freedom Probiotic, which he co-developed with the California biotech company Celprogen, Inc. Manzo Pharmaceuticals is dedicated to providing solutions to the issues associated with lactose sensitivity and a supplement for restful sleep. For more information about Manzo Pharmaceuticals, go to http://www.lactofreedom.com. Follow Manzo Pharmaceuticals on Facebook at http://www.facebook.com/manzopharma.